Some of the Conjuring Arts staff and volunteers were very privileged to witness a performance by Michael Moschen last Saturday when he performed at the NYU Skirball Center. 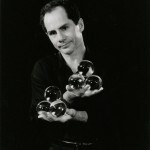 For those that don’t know him, he is a stupendously creative juggler and artist. We were very impressed with the show which featured a number of juggling feats and visual surprises combined with insight from Mr. Moschen into his creative process and other aspects of his unique performance. 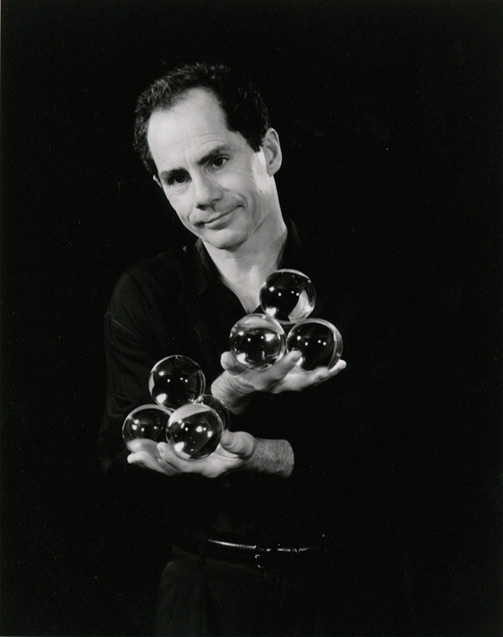 He began his routine by juggling some white balls in a variety of forms and fashions, switching to colored balls so the audience could participate and watch certain colors and ascertain the balls progress as they traveled. It was fun to try and keep up with the various colors. 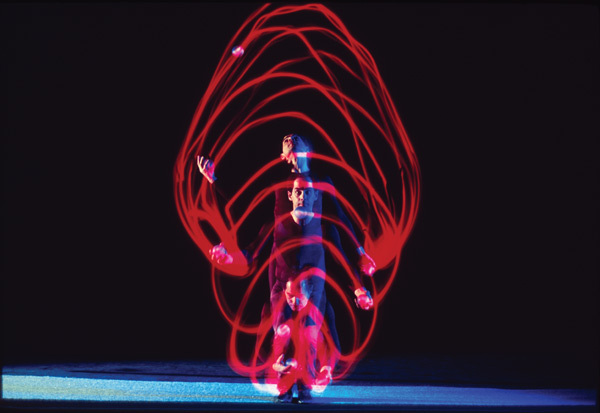 Then he had us perform a dexterous motion with our fingers, which transformed into a demonstration of contact juggling, and we were all thrilled when the motion we had been making proved to be part of the routine. One of the highlights was his routine with sticks. 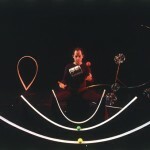 He started out manipulating a single shining stick. It was marvelous how the light bounced off the stick as it went through its routine. The piece progressed with more sticks and more stunning feats, etc. 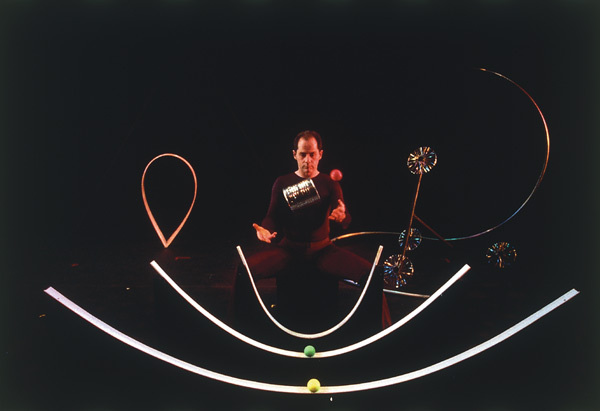 Mr. Moschen also included a performance of the Triangle which is a fascinating sequence of juggling utilizing a giant triangle in the center of the stage. It was used as a surface to develop a myriad of paths for the balls to take before returning to his hands and also as a sounding board; creating a rich routine both visually and audibly. One of the pieces was on balance and cheating. He related that balance is a conversation between you and the top of the object demonstrating this with a long stick. When the top moved one way or the other, he had a certain amount of time to respond and regain balance in order to continue the conversation. Of course, the conversation plays out much faster with shorter objects, so Mr. Moschen demonstrated his ability to balance a pencil on his head! This led to a discussion of cheating wherein he explained how gripping the object in any way when learning to balance stifles your ability when you try to balance an object elsewhere on the body. Like magic, for the most part, in juggling you are on your own, and it is up to you to decide whether to learn it the right way or take shortcuts which may hamper your ability in the future. The performance was fascinating, and Mr. Moschen’s skill is astounding, however, some of the best parts were his thoughts on the different routines he was doing. He seemed quite candid and, at the end of the show, allowed some time for a question and answer session. We were quite pleased that someone asked him about his practice regimen and he said, “I practice four hours in the morning and four hours in the evening”. That is eight hours of practice a day! We had better get to work. Learn more at Michael Moschen’s website and also check out his TED talk.